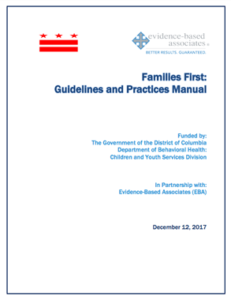 Evidence-Based Associates (EBA) has worked with the District of Columbia since 2009 to help oversee the implementation of a variety of evidence-based programs for at-risk youth and their families. Child Parent Psychotherapy for Family Violence (CPP-FV) is a therapeutic intervention for young children with a history of trauma exposure or maltreatment and their caregivers. CPP-FV supports child development, restores the child-parent relationship and the overall feelings of safety, while reducing symptoms associated with the experience of trauma. Typically conducted in a(n): Adoptive Home, Birth Family Home, Foster Home, and Outpatient Clinic. Parent Child Interaction Therapy (PCIT) is a supported treatment for young children who are experiencing extreme behavioral difficulties. It places emphasis on improving the quality of the parent-child relationship and changing parent-child interaction patterns. Children and caregiver participate in a series of therapy sessions: approximately 12 to 16 sessions. Trauma-Focused Cognitive Behavioral Therapy (TF-CBT) is an intervention designed to help children, youth, and their parents overcome the negative effects of traumatic life events and address feelings. Children participate in a series of approximately 12 to 16 therapy sessions. Transition to Independence Process (TIP) is a practice model which prepares youth and young adults (ages 14-29) with emotional and behavioral challenges for the transition to adult roles by engaging them in their own futures planning while providing developmentally-appropriate supports. TIP involves youth/young adults, their families, and other key players in a process that facilitates movement towards greater self-sufficiency and successful achievement of their goals. Delivered the in family’s natural environment-homes, schools, community. Trauma Systems Therapy (TST) is a comprehensive model for treating traumatic stress in children and adolescents that adds to individually-based approaches by specifically addressing the child’s social environment and/or system of care. TST is designed to provide an integrated and highly coordinated system of services guided by the specific understanding of the nature of child traumatic stress. TST focuses on the interaction between the child’s difficulties regulating their emotions and the deficits within the child’s social environment. TST is a planning approach that includes input from children’s homes, schools, community. Child/Youth/ Young Person: TST is applicable to a wide range of populations and service settings. 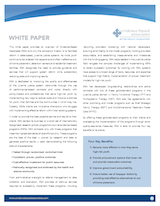 Therefore, exclusion criteria will be determined at the clinical discretion of the team at each provider site. Average length of stay 9-18 months. Functional Family Therapy (FFT) is a family focused intervention for at-risk and juvenile justice involved youth. Families participate in a series of sessions over a 3-5 month treatment period.